I have two of these keyboards that came from a surplus equipment supplier. These were originally built from kits, apparently for a vocational school. Based on the age of the parts and the instructions, it appears Jameco sold these in the early 1980's. After a phone call to Jameco, I received four pages of faxed instructions for this device. I received four pages of documentation from Jameco via fax. These pages have a copyright date of 1979. 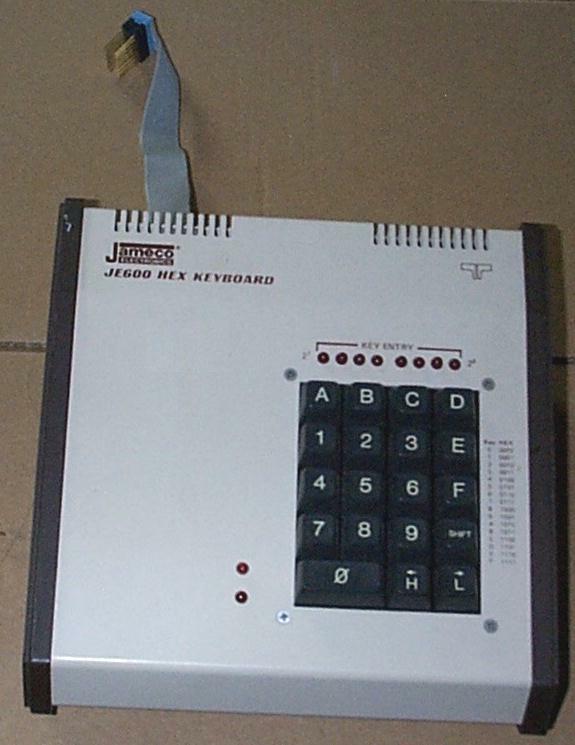 DESCRIPTION: The JE600 encoder key board provides 2 separate hexadecimal digits produced from sequential key entries to allow direct programming for 8-bit microprocessor or 8-bit memory circuits. Three additional keys are provided for user operations with one having a bistable output available. The outputs are latched and monitored with LED readouts. Also included is a key entry strobe. Full 8-bit latched output for microprocessor use. 3 user define keys with one being bistable operation. Debounce circuit provided for all 19 keys. LED readout to verify entries. Easy interfacing with a standard 16 pin IC connector. Requires on +5 VDC for operation. Wire, solid 22 AWG or eq 6"
USER KEYS: "SHIFT," "H" and "L"
Each key has a de-bounce circuit that provides a logic high output when pressed and is capable of driving one TTL load. 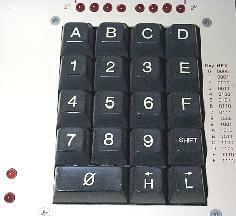 In addition, the "SHIFT" key is connected to a bi-stable circuit to provide a toggle-switch action for controlling remote circuits. This bistable output is capable of driving approximately 4 TTL loads. The LED indicator (LED9) is on when logic "ONE" is at the output. 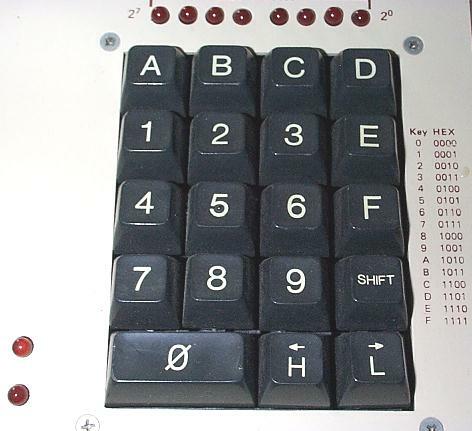 HEXADECIMAL KEYS "0" to "9" and "A" to "F"
Each key closure operates the encoder chip "U1" to produce a hexadecimal digit at its output. The logic is such that if two (2) keys are pressed at the same time, the signal at pin 24 of that IC (U1) will go to logic zero to clear U5, thus preventing false entries. See "Encoder Timing Diagram" for normal entries. Note that the data from the previous entry is transferred to the second quad latch (U2). If, for example, you enter the numbers "A6" the register will contain "10100110," the least significant bit being on the right. The latched outputs are capable of driving approximately four (4) TTL loads. Each key closure causes an output strobe on pins 10 and 16 of J1. This can be used as an interrupt for key entries provided there is a slight delay from its leading edge to data entry time to allow the logic levels to settle in the latched outputs. The LED register above the keyboard displays the logic output with the "ONE" represented by a lighted LED. The U1 integrated circuit in the schematic is a Harris HD-0165 Keyboard Encoder. You can see a datasheet (Adobe Acrobat format) here.